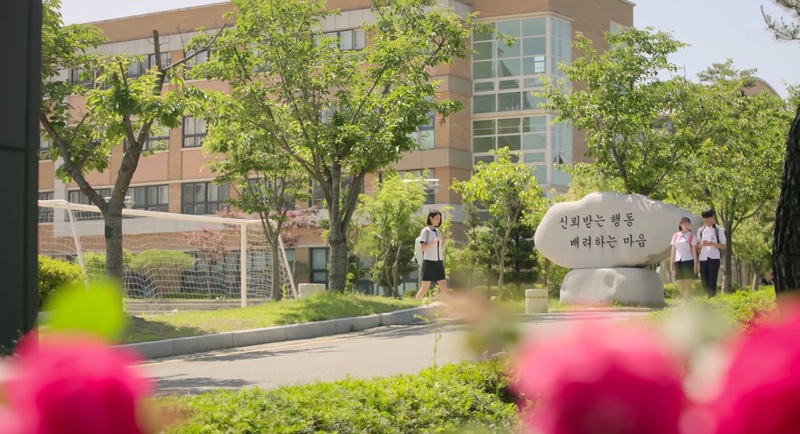 This school building is the setting for Seoyeon High School, where the friends in web drama A-Teen/Eighteen (에이틴) (Playlist Studio, 2018) study at. The scenes of the group — comprised of Do Ha-na/Do-ha (Shin Ye-eun), Kim Ha-na/Kim-ha (Na-eun of APRIL), Cha Ki-hyun (Ryu Eui-hyun), Yeo Bo-ram (Kim Su-hyun), Nam Si-woo’s (Shin Seung-ho) and Ha Min (Kim Dong-hee) — are filmed around the entrance, field and classrooms. In episode 7, Si-woo waits for Do-ha at the adjacent street to make sure that she reaches school on time, but they both end up being late. Nakwon Middle School [낙원중학교] is located in Seongnam’s neighborhood of Pangyo-dong [판교동] in the Bundang District [Bundang-gu/분당구]. It is not too far away from St. Francisco Cathedral of Pangyo [판교 성프란치스코성당]. Pangyo Station [판교역], Sinbundang Line, Exit 4. Take the bus 380 from Pangyo Station South bus stop (판교역남편 정류장) for 9 stops to Pangyowon Village 11/Nakwon Middle School bus stop (판교원마을11단지.낙원중 정류장), and you’ll be dropped at the school’s back door. To get to the front, walk around the perimeter of the school building (the street should be on your right hand side) and take a left into Seopangyo-ro 132beongil.